Its plan included lecture halls, concert halls and extensive galleries. It’s seating capacity was over 3,000. 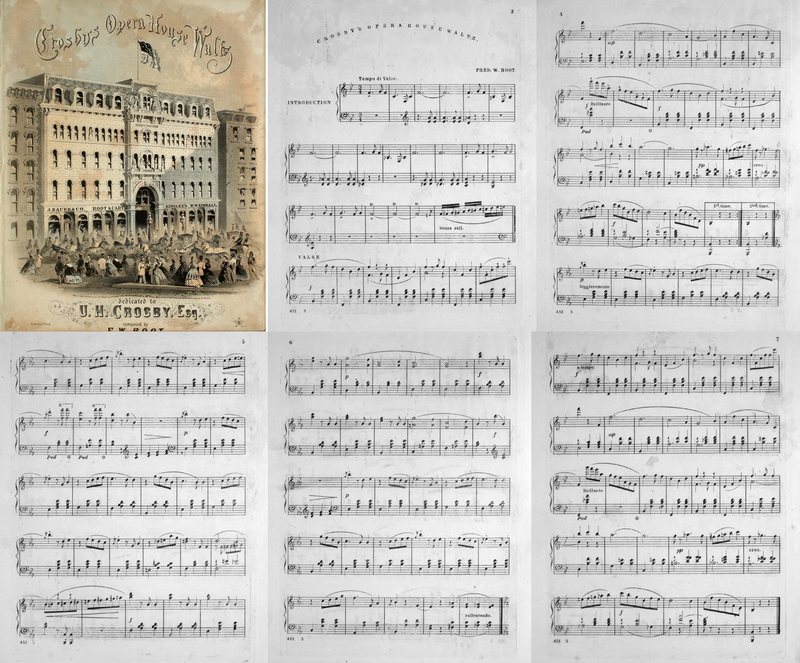 The first floor was home to several retail businesses, including music publishers Root & Cady (who had moved from Clark Street), the piano store of W. W. Kimball, and the confectioner and restauranteur H. M. Kinsley. The second and third floors were occupied by business offices, while the fourth held an art gallery and the studios of several artists. 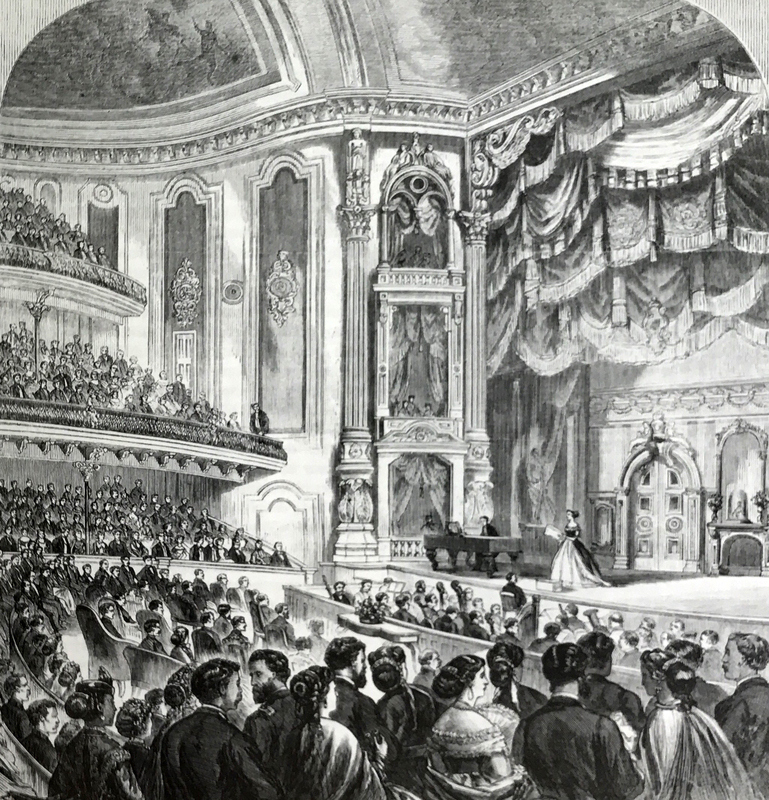 A full description of the Crosby Opera House interior can be found in the section describing the 1866 Chicago Illustrated engravings. The Crosby Opera House turned on its lights for the first time since it began it’s summer long renovation just a few hours before The Fire hit. It was to be the most beautiful opera house in America. It was to re-open on the evening of 9 Oct 1871. The Field & Leiter building on State and the Second Presbyterian Church on Wabash can be seen. 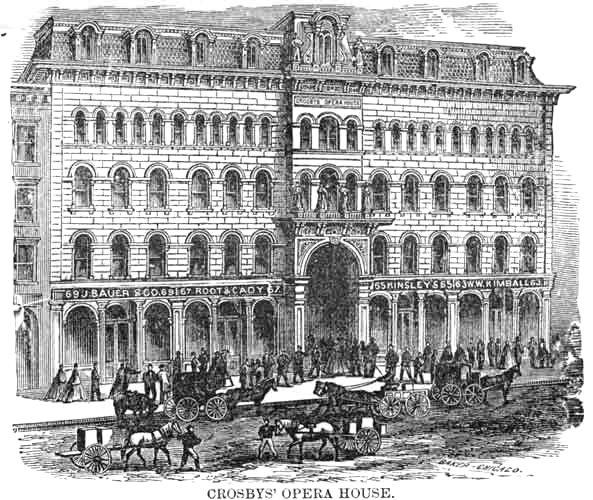 Crosby’s Opera House was beset by bad timing and worse luck throughout its brief life. It was scheduled to open on April 17, 1865, with a performance of Verdi’s Il Trovatore by Grau’s Italian Opera Troupe, but the premiere was postponed three days because of the assassination of President Lincoln on April 14. Crosby ran into severe business difficulties. 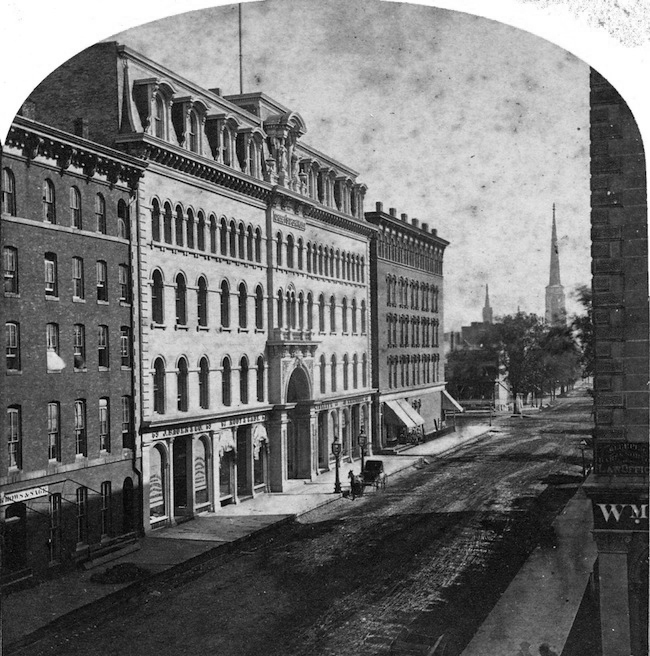 As a result of what the Chicago Tribune called his “disastrous failure,” by 1866 he was forced to sell the building. A group of prominent Chicagoans who wished to assist him arranged a sale by lottery. Tickets cost $5 apiece, and approximately 210,000 were purchased by individuals in Chicago and throughout the country, some 25,000 by Crosby himself. 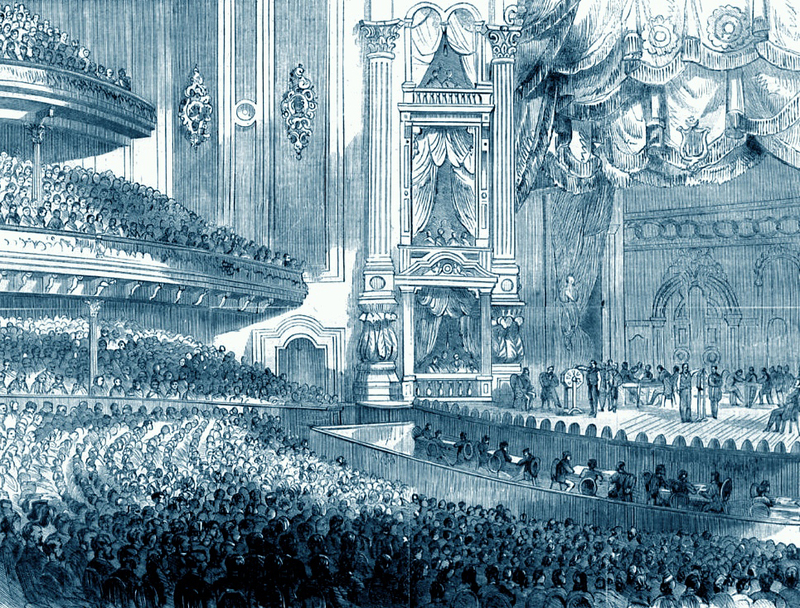 The selection of the winner took place in the theater on January 21, 1867, before a packed audience. The excitement in the great room was palpable as the moment of decision approached. The winner was one A. H. Lee, from Prairie du Rocher, Illinois, who sold the building back to Crosby for $200,000, a sum that was considerably less than Crosby’s proceeds from the lottery, so he both made money and got to keep his beloved opera house. The drawing on the stage was under the supervision of a committee of staid business men from Chicago, Boston, New York, Philadelphia, Saint Louis, Detroit and Fall River, Massachusetts. In one great revolving device 210,000 numbered cards were placed. In a small one were 302 tickets, representing as many articles to be raffled. Drawings from each were made simultaneously, the holder of the drawn ticket from the large wheel being in each case the winner of the prize designated by the number on the ticket of the other wheel. Excitement was intense when, well on in the drawing, ticket 58,600 called for the grand prize, the Crosby Opera House. The holder of the lucky number was not present, but he proved to be A.H. Lee, of Prairie du Rocher, Illinois. Crosby’s luck now seemed to have turned for the better. By early 1871 he made plans for a major renovation of the theater, which took place that summer. The much anticipated re-opening was scheduled for October 9, with a concert led by maestro Theodore Thomas. But the Great Chicago Fire proved to be the final performer at Crosby’s, bringing down the house before Thomas could raise his baton. The Opera House had been brilliantly decorated and renovated throughout until it had no equal for beauty and richness in the country, and Mr. Thomas was to dedicate it anew. It was lit up for the first time on the evening of October 8, and two or three hours later it was in ashes. Mr. Thomas and his orchestra reached the Tvventy-second street depot just after the great fire broke out, and immediately made his arrangements to go South, and that night rested in Joliet. This fire cost us, among other losses, Schubert’s quartette in D minor, Schumann’s first and fourth symphonies, Beethoven’s third (‘ Eroica ‘) and fifth, as well as some grand concertos by Rubinstein, Mendelssohn, Beethoven, Littolf, Weber, Chopin and Liszt. The Crosby Opera House between Dearborn & State Streets shows high curbed walks and good street surface. 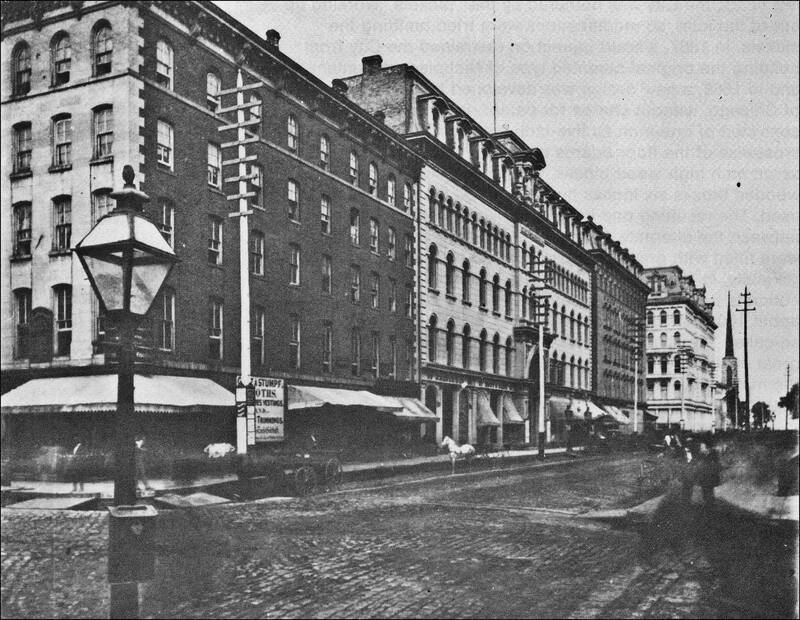 One of Chicago’s first gas lights, installed in 1850, is shown in foreground. 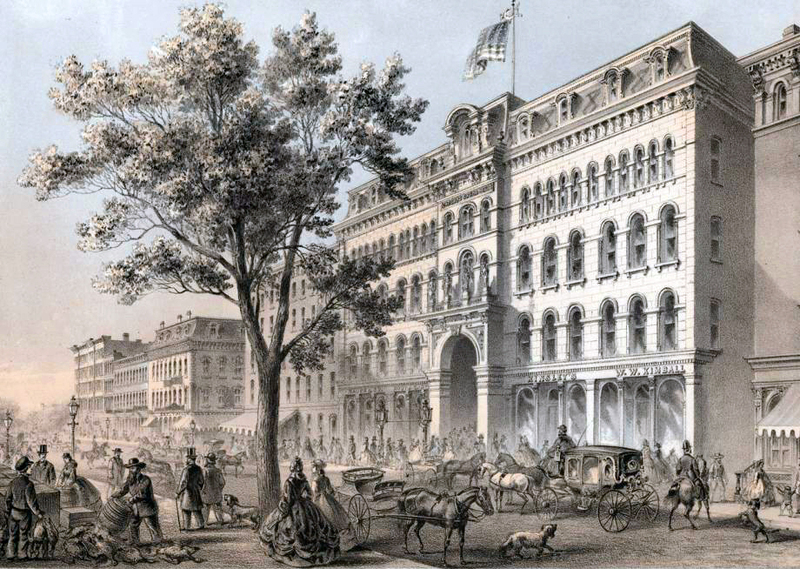 Chicago Block 37, on which Crosby’s Opera House was located, continued to be a star-crossed site. In 1989 the city demolished the deteriorated properties then on the block, and, only after almost twenty years of discussions, disputes, and deals that fell through, it has only recently been redeveloped. During a portion the period when Block 37’s fate was in limbo, however, it hosted a summer outdoor art studio for Chicago public school students—named gallery37—and a skating rink during the winter. This stereograph of Crosby’s Opera House looks east along Washington Street. The tall steeple is that of the Second Presbyterian Church, which was built at Washington Street and Wabash Avenue in 1852. Its architect was James Renwick, the designer of St. Patrick’s Cathedral in New York and of “The Castle,” the original building of the Smithsonian Institution in Washington. Like Crosby’s Opera House, it was lost in the fire. Unlike Crosby’s, it was rebuilt, though not in the same place. It moved to its current site at 1936 South Michigan, close to the Prairie Avenue neighborhood where several of its wealthy parishioners lived. 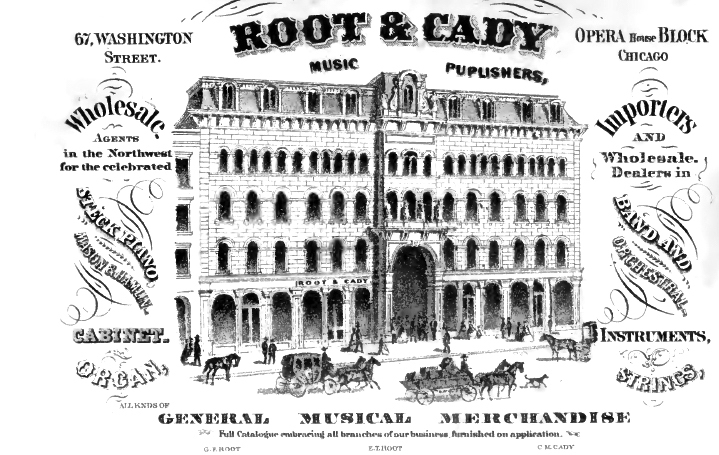 An 1867 ad for the Root & Cady Music Publishing Company which was located inside the Crosby Opera House. William W. Kimball was the Opera House’s first tenant and Mr. Kimball was good friends with composer Dr. George Frederick Root. The composer’s younger brother, Ebanear Root, a singer, along with music conductor, Chauncey Cady, formed the music publishing business in 1858. The company became the largest music publishing house and instrument dealer in the West. 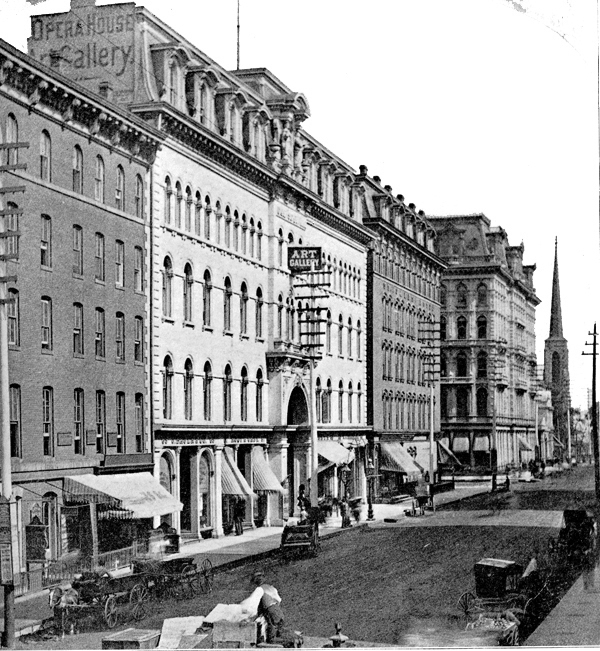 After the Great Fire destroyed the Opera House, Mr. Kimball opened his piano store on the southeast corner of State and Adams. His first year’s rent was $12,000, but he received over a million dollars in sales. Mr. Root and Mr. Cady went separate ways. Mr. Root gave up selling musical instruments, continued to sustain a business long enough. Mr. Cady went bankrupt and left Chicago. Dedicated to U.H. Crosby, Esq.